Announcement! 2 Vegans 1 Country Hits the Road! 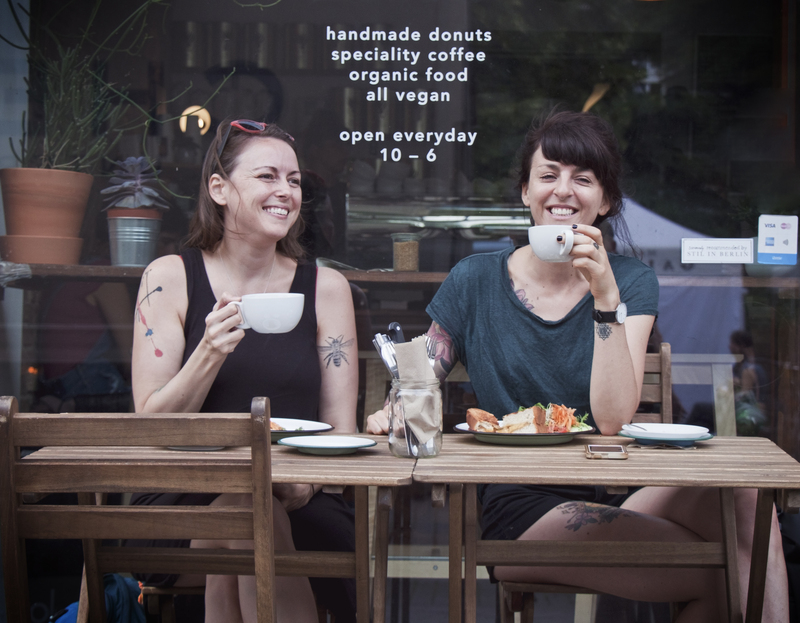 Randi and I met in Bangkok two years ago and discovered our shared passion for donuts and burgers, and so it only made sense that we unite our voices in order to stuff our faces with delicious vegan food and share it on our blogs. We’ll be visiting Berlin, Leipzig, Frankfurt, Munich and Hamburg to taste all the vegan food and we’ll be documenting it on our blogs for you to drool all over your keyboard. Berlin has a reputation amongst vegan travelers for being one of the best, if not the best city to be vegan in, but what about the rest of the country? Currywurst only? NEIN! Guess what: there’s also vegan currywurst! We’re using Berlin as a springboard to help spread the vegan love through the whole of the country and debunk the myth that the rest of Germany is just a land of sausages and schnitzel! Are you a vegan living in any Berlin, Leipzig, Frankfurt, Munich or Hamburg? We’d love to hear from you! Help us discover the bestest your city has to offer. And don’t forget to follow us on Instagram for behind the scenes and live stories. This entry was posted in 2vegans1country, Berlin, Europe, Germany on September 26, 2017 by Amélie. Wow! I don’t know anything about eating vegan anymore (I was a vegetarian 25 years ago, when I was in my teens), but my current food needs don’t really make vegan eating on my radar EXCEPT that nowadays a lot of vegan stuff is also gluten free. Which is great for me because I’m celiac and can’t eat gluten. I also wouldn’t expect Berlin to be a hotspot for vegan food! That’s actually pretty cool to know. Again, because sometimes, I also benefit by being able to eat great food that won’t make me sick! That’s an excellent way to combine sources to share the knowledge and places worth visiting to your attentive audience. Great idea in doing a project that highlights your interest and shared focus on Vegan dining. I’m not vegan, but I’m looking forward to hearing more. I know I was really surprised to hear that Ghent in The Netherlands was a great place for Vegans – have you tried there? Ooooh no I haven’t, thanks for mentioning that! Safe travels ladies! Bangkok is a great place to meet similar minded people, it’s our favorite city in the world. More an more cities have great vegan options, I am not vegan but have vegan friends. That’s really cool! Have fun and enjoy German cuisine vegan-style. Safe travels! Very cool. I’m not vegan myself, but I do enjoy vegan food, and I also plan to explore more of Germany in the near future. I’ll be looking forward to more of your posts on the subject! Thats a cool blog project,’im not a vegan but I do try vegan food now and again. This will be a great piece for vegan people visiting those on your vegan food route. I am a Vegan and would love to know about the vegan options in Germany and other countries. This is surely going to be interesting and will follow you guys. I sure did! Berlin is SO vegan friendly!